The manuscript antiphonary was inscribed by Joanes Von Werd de Augusta of Augsburg for the Kranj parish, and finished in 1491. It is preserved in the Archdiocesan Archive in Ljubljana. 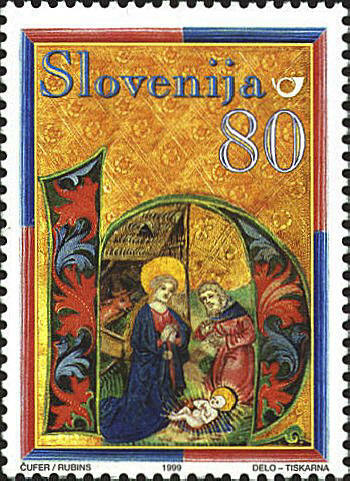 The stamp depicts an H illuminated with a scene of Mary and Joseph worshipping the baby Jesus. In the background we can see an ox.